Top health officials in the U.S. say the Zika virus is “scarier” than first thought. The Zika virus is transmitted by mosquitoes. It can cause birth defects, such as an abnormally small head, a condition called microcephaly. Dr. Anne Schuchat is Principal Deputy Director of the U.S. Centers for Disease Control. Dr. Anthony Fauci is with the National Institute of Allergy and Infectious Diseases. They both spoke at the White House this week. From the White House, Schuchat warns the U.S. needs to be ready. Schuchat and Fauci said there are other health problems linked to Zika, not just microcephaly. Those health problems may include Guillain-Barre syndrome, which paralyzes. Also, patients have shown brain inflammation that looks like multiple sclerosis. Schuchat said there are other troubling developments. Officials say they are worried about the spread of the disease. They say “hundreds of thousands” could become infected in the U.S. territory of Puerto Rico. They have asked Congress for $1.9 billion to fight the virus. Fauci said if Congress does not act, health workers will not be able to stop Zika from spreading. 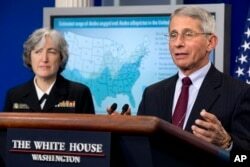 Fauci said health officials are fighting the virus with money borrowed from other funds. Last week, the Obama administration said it was directing $589 million to fight Zika. The money had been set to fight Ebola, but is now going to Zika. Obama administration officials have warned that without more money to fight Zika, infection might increase. Officials say there will be delays in controlling and monitoring mosquitoes, and in testing and developing a vaccine. There are at least 672 confirmed cases of Zika in the United States. These include 64 pregnant women. One Zika-related case of microcephaly was confirmed in the island state of Hawaii. 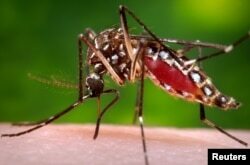 Health officials say in the United States, the virus has been reported mostly in Puerto Rico, the U.S. Virgin Islands and American Samoa. But they say they believe it will spread in the continental United States in the coming months. Schuchat said she does not expect there will be large numbers of infections in the 48 states between Canada and Mexico, but she is not certain. At the recent press conference at the White House, Schuchat said that the mosquito spreading Zika is found in more U.S. states than first thought. About 40 million people travel yearly between the continental U.S. and countries with Zika. The Obama administration says that as of last week, 33 countries and territories in the Americas reported active cases of Zika. In Puerto Rico, 31 health workers from the Centers for Disease Control are working. A center used to fight dengue fever is now fighting Zika. That includes controlling and monitoring mosquitoes, and educating pregnant women about avoiding infection. Schuchat said that about 5,000 packages have been given out in Puerto Rico. The packages include chemicals to repel mosquitoes, information on how to protect against infection, condoms, and vouchers to buy screens to keep mosquitoes from entering the home. VOA Correspondent Aru Pande reported this story from The White House. Christopher Jones-Cruise adapted it for VOA Learning English. Kathleen Struck was the editor. dengue – n. a disease spread by mosquitoes that causes flu-like sympts. It can develop into severe dengue, which can be fatal.